The amendment introduced by Rep. Tim Huelskamp of Kansas after the Supreme Court struck down Section 3 of the Defense of Marriage Act deeming it unconstitutional has 38 sponsors but none of the senior members of the House GOP leadership team have signed on to co-sponsored the measure. 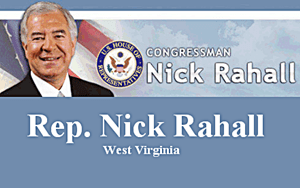 Yesterday though West Virginia Rep. Nick Rahall became the first Democrat to sign on to the proposed Federal Marriage Rahall was one of nine house democrats who voted in 2011 to uphold the Defense of Marriage Act. Rahall is the most senior of five Arab American lawmakers in Congress. It’s so nice to see that the Democrats can keep their house in order. NOT! Separated At Birth: GOProud’s Jimmy LaSalvia and……..